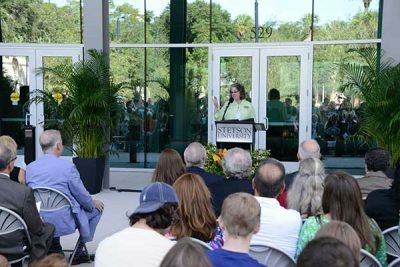 Stetson University President Wendy B. Libby, Ph.D., addresses the crowd at Saturday’s grand opening of the Rinker Welcome Center. The $7 million Marshall & Vera Lea Rinker Welcome Center is now open, providing students with key services, welcoming back alumni and providing space for employers to meet with prospective job candidates. 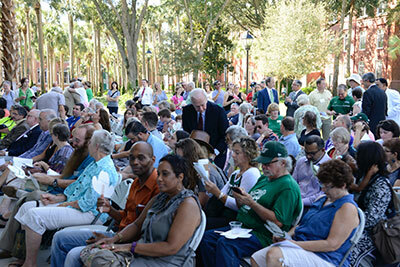 People gather for the grand opening of the Rinker Welcome Center on Saturday. The three-story brick and glass Welcome Center celebrated its grand opening Saturday, attracting a crowd to tour offices that include Admissions and Enrollment Management, a “one-stop” service area with the Registrar, Bursar and Financial Planning, meeting rooms, and Career and Professional Development for current students and alumni. The offices are open from 8 a.m. to 4:30 p.m. Monday through Friday. 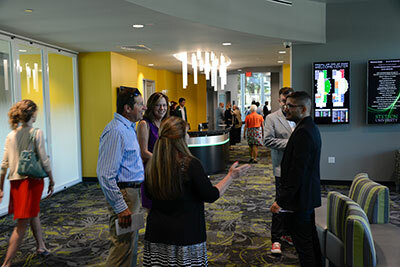 Visitors mingle in the lobby of the new Rinker Welcome Center on Saturday. See time lapse video of construction. Work began in the summer of 2015 on the 28,000-square-foot building, just off Woodland Boulevard and Minnesota Avenue. The building was designed to blend into the historic area of campus and has earned a Green Globe Certification for its environmentally friendly design, including a metal roof that lasts 50 years and reflects heat; recycled carpet; solar-powered lights in the parking lot; and landscaping with native plants that use reclaimed water from the city of DeLand. Funding for the building came from donors to the university’s comprehensive capital campaign, including: John and Sheila Rinker through the Marshall & Vera Lea Rinker Foundation; Christine E. Lynn, through the E.M. Lynn Foundation; Lee McGraw, through the Elizabeth B. McGraw Foundation; Glen W. Hauenstein; and several other significant estate gifts.